Cobalt is a Responsive Multipurpose joomla theme. It has 6 Home versions, 3 About pages, 4 Blog Pages, multiple colors style and 2 layout to select. You can set different patterns for boxed layout. You can also use RTL layout and multiple languages. 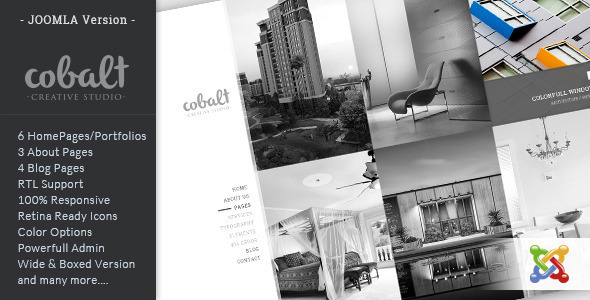 100% Responsive Cobalt is 100% responsive, each and every elements are fully responsive. 6 Home versions Cobalt includes 6 Home versions for different purpose. 3 About Page Cobalt includes 3 About Page versions. 4 Blog Page Cobalt includes 4 Blog Page versions. RTL Support You can also set RTL Layout From template options. Language Support You can use this theme for multiple languages. This entry was posted in cms-themes, joomla and tagged architecture, bootstrap, cms, creatives, full width, gallery, Infinite-Scroll, joomla, masonry, multipurpose, photographers, photography, portfolio, responsive by Acty. Bookmark the permalink.